Children collect stagnant water for use at home in Glen View, Harare, on Sunday. South Africa is sending more military doctors to its northern border to treat Zimbabwean cholera victims, underlining fears of a regional disease outbreak linked to Zimbabwe's collapse. 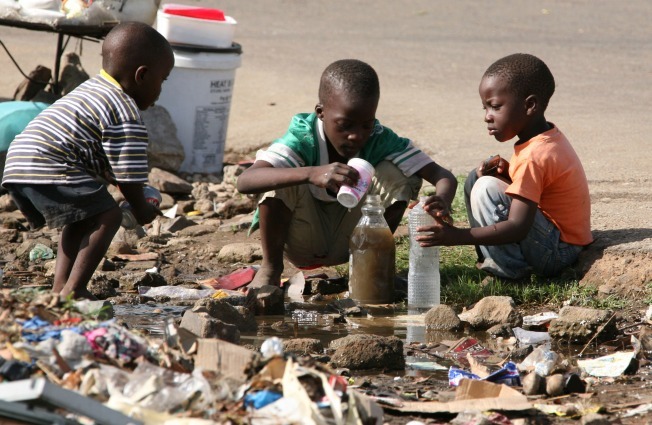 GENEVA — The United Nations says the death toll from a cholera outbreak in Zimbabwe has risen to 746. The U.N. humanitarian office says the total number of suspected cases reported in the southern African country has risen to 15,572 since the start of the outbreak in August. It last reported 589 people had died and 12,700 were sick. The latest figures published Wednesday follow a warning from the World Health Organization that the total number of cases could reach 60,000 unless the epidemic is stopped. Cholera has spread in Zimbabwe because of the country's crumbling health care system and water supply infrastructure.